Cancer immunotherapy — efforts to boost a patient's own immune system, allowing it to better fight cancer cells on its own — has shown great promise for some previously intractable cancers. Yet immunotherapy doesn't work for everyone, for reasons that aren't always clear. Most research and new therapies in this field have been focused on CD8+ T cells, a type of immune cell that recognizes and destroys other cells that display cancer antigens (mutated proteins that help give rise to tumors). Meanwhile, another type of immune cell, CD4+ T cells, and the molecular signals they recognize have received less attention. 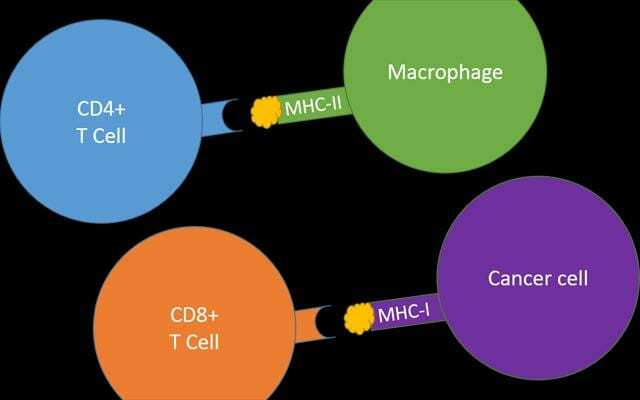 Using a bioinformatics approach, University of California San Diego School of Medicine researchers found that CD4+ T cell's binding partner, a molecule called MHC-II, may have even more influence on emerging tumors than MHC-I, the better known partner of CD8+ T cells. "The more we know about the ability of a person's immune system to clear cancer cells before they take hold, and the more we can combine that with other information about their inherited risk factors or environmental exposures, the better we may get at predicting a person's cancer susceptibility," said senior author Hannah Carter, PhD, assistant professor of medicine at UC San Diego School of Medicine. Carter led the study with first author Rachel Marty, a graduate student in her lab. Carter and Marty's study centers on the Major Histocompatibility Complex (MHC), a family of molecules displayed on the surface of most cells in the body. MHCs hold out antigens — bits of just about everything from inside the cells — and display them to T cells, immune system surveyors that are constantly checking for infected or damaged cells. If T cells spot MHC molecules with "self" antigens, they leave the cell alone. But if they spot foreign antigens, like those from bacteria or viruses, or mutated self-antigens, they kill the cell before the damage spreads. In a previous Cell study, Carter, Marty and team found clear associations between a person's MHC-I genetic makeup and the genes mutated in that person's cancer. That makes sense, Carter said, since cancer antigens that are presented by MHC-I would lead to early elimination of those cancer cells by T cells. From the opposite point of view, if a person's MHC-I molecule does not recognize and display a cancer antigen, that particular abnormality is more likely to show up in that person's tumor. This played out clinically, too — the researchers found that the fewer the cancer antigens a person's MHC-I can recognize, the earlier in life they're likely to get cancer. Carter said that it's possible this information could someday be used to predict the type of cancer a person might get, how it might behave and how it might best be treated, all before the tumor even gets started. But MHC-I doesn't tell the whole story about the ability of a person's immune system to respond to tumors. Humans also have a related molecule called MHC-II. MHC-I is displayed on the surface of every cell, and thus any cell with the potential to become cancerous. MHC-II, on the other hand, is only displayed by professional immune cells, such as macrophages. MHC-II is also a more complex molecule, and it can bind a larger range of antigens than MHC-I. Both molecules play an important role in keeping would-be tumors in check — while cancer cell precursors might be able to evade detection by one, they're less likely to escape both. Curious about the underappreciated member of the MHC family, Carter's team focused on MHC-II in their latest study. Similar to their MHC-I study, they applied computational biology methods to data available from The Cancer Genome Atlas (TCGA), the National Institutes of Health's database of genomic information from thousands of different human tumors. They scored 5,942 patient tumors based on the ability of their MHC-II molecules to present 1,018 cancer antigens for inspection by their CD4+ T cells. The researchers found that an antigen that is well recognized by a person's MHC-II is less likely to show up in his or her tumor than a mutation overlooked by MHC-II. This was even more true for MHC-II than MHC-I. However, Carter and team were surprised to find that, unlike MHC-I, MHC-II's ability to recognize antigens had no correlation with the age at which a person was diagnosed with cancer. "Imagine there are 100 mutated antigens that can cause cancer," Carter said. "If a person's MHC-I can only present 20 of those antigens, they would have less coverage than someone who can present 80. When people can't present a lot of mutations, they tend to get cancer at an earlier age. That's true for MHC-I, but we couldn't find that same correlation for MHC-II, at least not in this early analysis." MHC-II is more complex than MHC-I, and the tools for studying MHC-II are not yet as sophisticated, Carter said. But as the field advances, she hopes to see researchers and clinicians take both MHC-I and MHC-II data into account when developing and personalizing cancer immunotherapies. She believes this information could help determine why some people respond to immunotherapy and others don't. What's more, she hopes doctors might someday be able to use MHC-I and -II readouts to predict a patient's response before they are given immunotherapy, sparing non-responding patients from the potential side effects of ineffective therapies. "Bringing MHC into the big picture of cancer through genomic analysis is a powerful new way to integrate the master regulator of immunity into a better understanding of cancer evolution and its dynamic interplay with the immune system," said study co-author Maurizio Zanetti, MD, professor of medicine at UC San Diego School of Medicine and head of the Laboratory of Immunology at Moores Cancer Center. "This may represent a step forward in our ability to select the best form of immunotherapy for individual patients and likewise help better predict response to immunotherapy. I see this work as a major step to bridge cancer genomics and cancer immunity."